It’s rather difficult these days to find chocolate or sweets which is actually made in the particular country you are visiting. 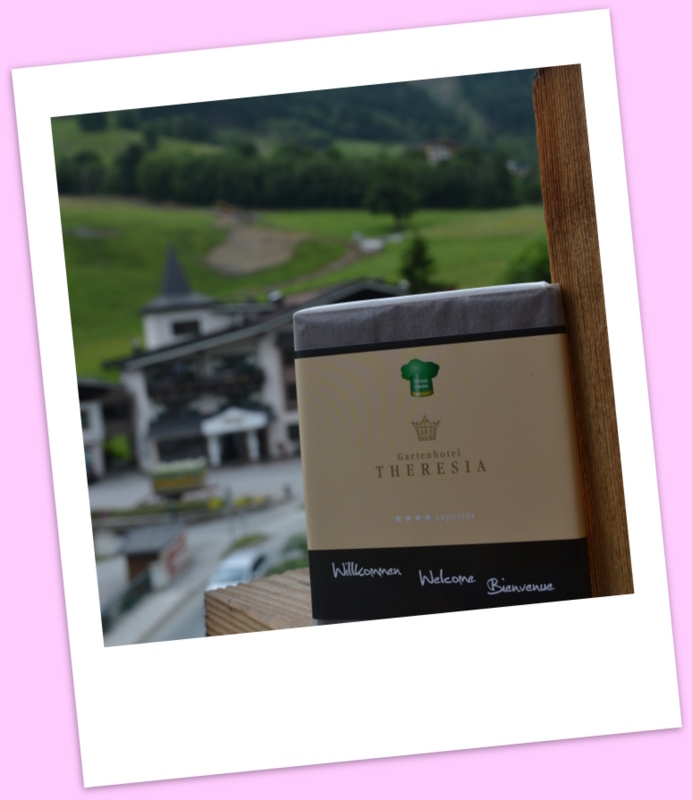 So we scoured our little village supermarket in Hinterglemm to try and find some goodies to review from Austria. 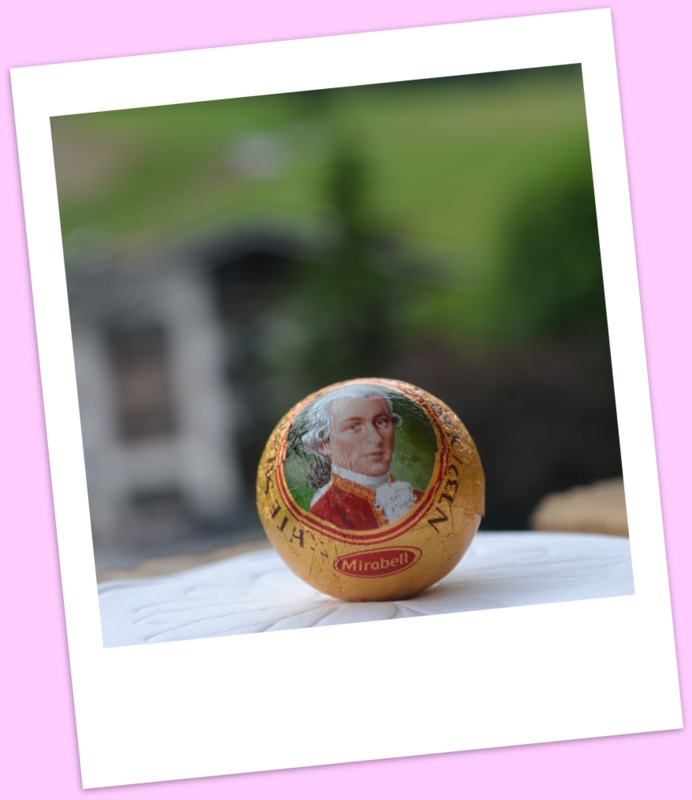 Of course, one sweetie you’ll see as soon as you step off the plane – and everywhere after that – are the Mozartkugeln by Mirabell. Round balls of dark chocolate which melt nicely in the mouth. 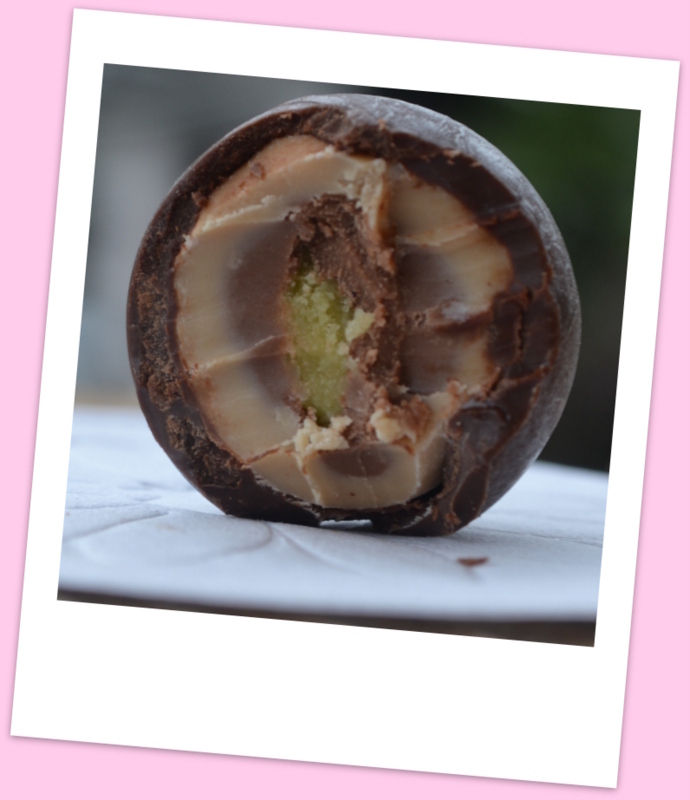 Inside is a layer of light praline cream, dark praline cream and in the centre a green core of marzipan. The marzipan tasted a little ‘floral’ to me, not almond marzipan. It turns out to be pistachio marzipan. There are 14 working stages and a manufacturing time of 2 1/2 hours for each ball! They used to be made by hand but nowadays machines have taken over due to demand as they are exported to 30 countries. After they have been made they will stay fresh for up to 8 weeks, however, they need to be kept away from heat. Our hotel had some at reception and gave us one each to try. I wasn’t keen on it as the chocolate had a white-ish coating and I could tell they weren’t fresh as the chocolate didn’t melt very well either. As soon as I bought a brand new packet from the supermarket I tried one and it was a completely different experience. Mozartkugeln come in all sorts of different size packets and boxes to give as gifts or just to scoff yourself. 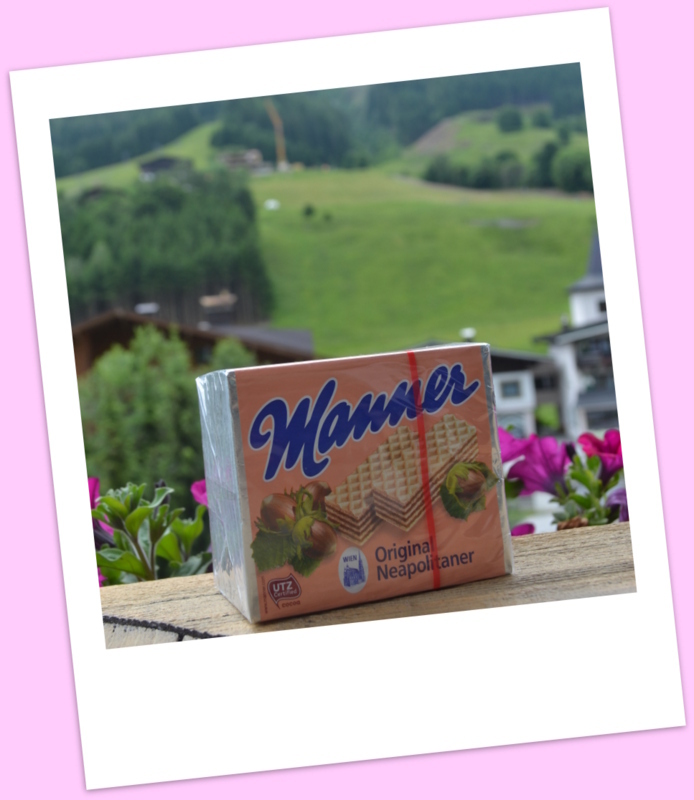 I’m not a great fan of wafer biscuits/chocolates etc., but as I said, it was difficult to find anything made in Austria and these were. 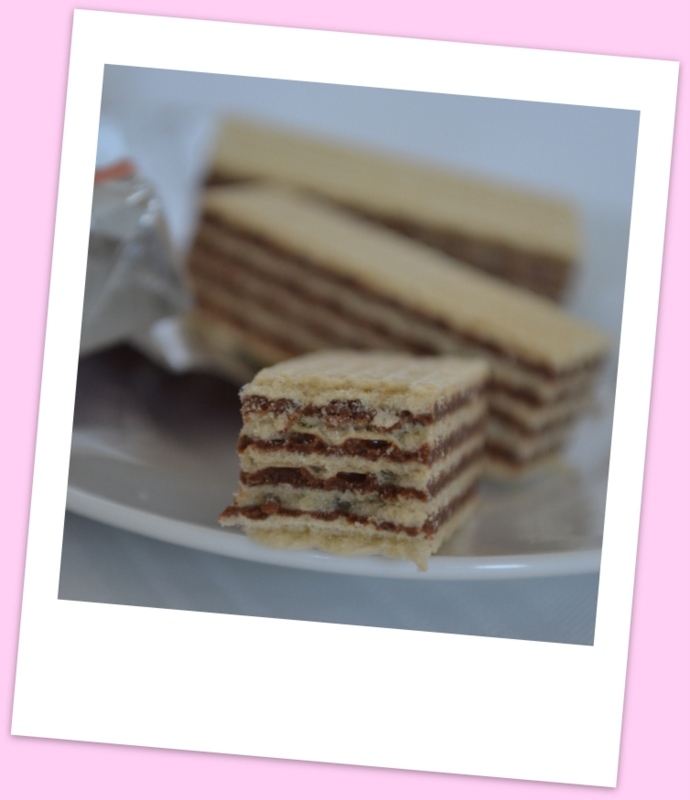 They are Manner Neopolitan Wafers, manufactured for over a hundred years using the original recipe by Joseph Manner. The very best ingredients and air-tight packaging ensure that special, delicious taste at all times. And they were indeed very fresh. They have a seal around the package to unwrap it and inside are ten small rectangular bars inside. They are just simply vanilla wafers with a hazelnut centre, a little like Nutella. The layers of thin crisp wafers melt on your tongue – they also stuck to my lips as I bit into them and to the roof of my mouth. BioArt Chocolate with the hotel’s name on it as a welcome present. Arriving in our hotel room the hotel very kindly left us a bar of BioArt chocolate. They also had several bars on display to purchase in reception. 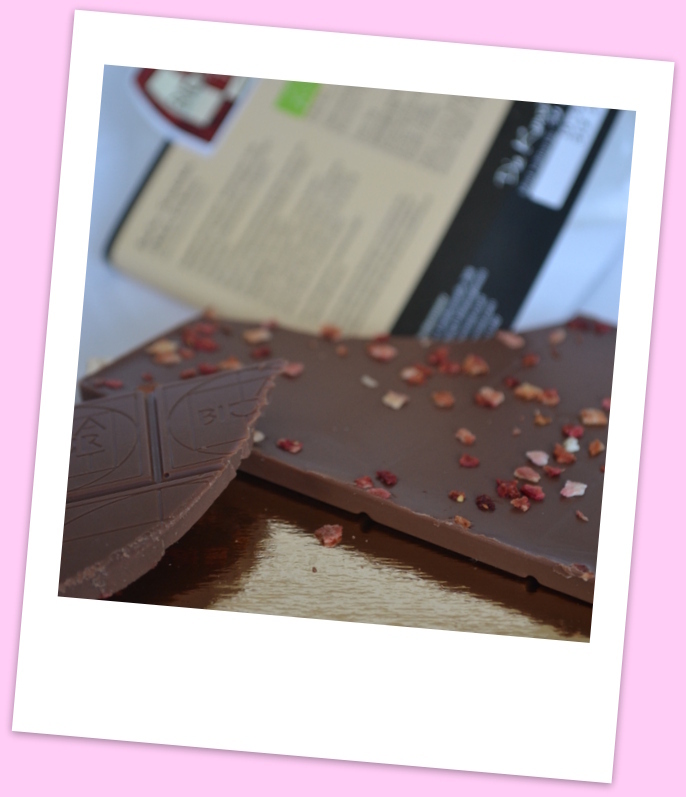 They were very nicely packaged and available with different messages to suit your needs, such as ‘sorry’, ‘thank you’ etc., The chocolate is handmade, organic and Fairtrade. Small pieces of dried strawberries. It was a very kind gesture but unfortunately I didn’t like the taste at all. Nor did my family. On the underneath of the bar there are small pieces of dried strawberries. As soon as you open the packet you can smell these. The chocolate is ‘strawberry milk’ and it tastes a little too ‘floral’ for me. To be fair, perhaps if the chocolate was without the strawberry flavouring it may have been quite nice. It’s not something I would choose, although this reminds me of our review on Butlers Chocolates, they have a white chocolate bar which contains strawberry pieces and this works well, perhaps because it is white chocolate and not milk. Still, it’s the thought that counts. So, would I buy any of these again when visiting Austria? Probably not, although the Mozartkugeln weren’t bad. But it’s interesting to see what other countries have to offer isn’t it? See our review of the hotel’s 7-course Gala Dinner which was wonderful!